This very robust but lightweight tackle container made of hard EVA offers tremendous space for big tackle boxes, accessories, clothes, boots etc. Due to the hard cover, the content is perfectly protected against damage from the outside. Additionally the bag is totally waterproof – thus your tackle is protected against infiltrating rain and water from the bottom. This premium lure bag made of solid and robust EVA material offers much space for XL lures, accessories and pliers. Due to the entirely waterproof material, this bag provides optimal protection against rain and splashing water. The upper compartment can be removed completely, within the main compartment below one big XL tackle box up to 10cm as well as further small tackle can be stored. This premium and highly robust shoulder bag with hard outer shell offers numerous features, which facilitate its application at fishing. The hard cover with woven-carbon fiber design offers perfect protection from damages. The wide, padded shoulder strap ensures an optimal carrying comfort even with heavy load. The Roving shoulder bag is designed in a way that guarantees unimpeded movements during fishing – when tackle is needed, the bag can be swung around and single compartments can be opened easily without the necessity of laying down the bag. Simple but brilliant! The Prorex XL Lure foldable bucket solves a significant problem of many trophy hunters and lure collectors – the save and space-saving containment of XL lures right after usage. Especially wet lures shouldn’t be stored in a plastic box right after application because of possible corrosion of hooks, steel wires and split rings. At the XL Lure foldable bucket, you can simply hook the lures into the holes of the upper splint – the lures dry and don’t lie all over the boat – more security and overview within the boat are the consequence. This big shoulder bag offers plenty space for numerous small pieces, documents, etc. Two big tackle boxes of the common size 36x22.5x5.5cm are included for the transportation and storage of soft plastic lures. 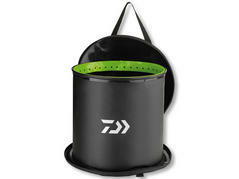 The rubberized bottom prevents the intrusion of moisture from below. Both front pockets additionally offer much space for the secure transportation of smaller lure boxes with supplies, jig hooks etc. 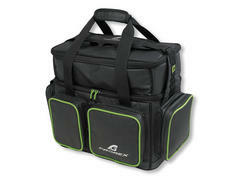 The padded shoulder strap ensures an optimal carrying comfort even if the bag is fully loaded and thus heavy. 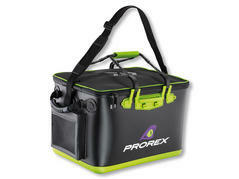 This shoulder bag for spin fishing offers much space for the storage of lures and supplies. 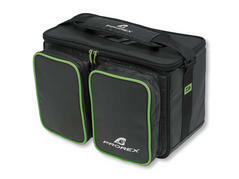 The bag is delivered including 3 big tackle boxes of the common size 36x33.5x5.5cm. The rubberized bottom prevents the intrusion of moisture from below. Both front pockets additionally offer much space for the transportation of smaller boxes for jig hooks, swivels etc. 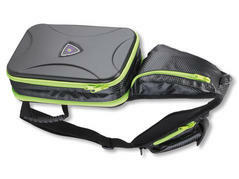 The padded shoulder strap ensures an optimal carrying comfort even if the bag is fully loaded and thus heavy. 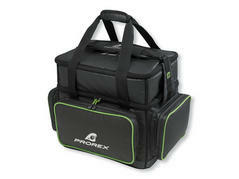 This extra big carrying bag offers enormous space for the storage of lures and supplies. The bag is delivered including 2 big tackle boxes of 36x22.5x5.5cm and one extra tall soft plastic lure box of 36x22.5x8.5cm. The tall box can store extra big soft plastic lures which do not fit into flat lure boxes. 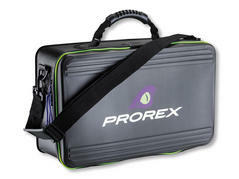 If you regularly go fishing for large specimen with big lures, you are well-advised with this Prorex lure bag XXL, since it offers enormous space also for XL-lures. The bag is delivered with 3 big and tall lure boxes of 36x22.5x8.5cm – ideal for large lures like plugs, jerkbaits, swimbaits etc., which do not fit into regular flat boxes. The big front pocket and both side pockets offer much space for smaller boxes and supplies.